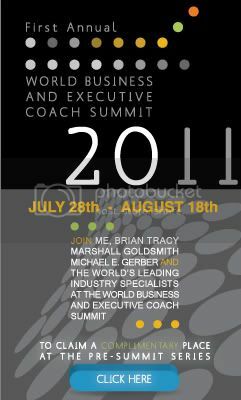 The First Annual World Business and Executive Coach Summit takes place online starting July 28, 2011. Before it starts, check out the pre-summit series webinars. These 20-30 minute no-cost webinars are on a variety of topics applicable to Business and Executive Coaches. The truth is coaches of all types will benefit from this information. Disclosure: While these Pre-Summit webinars are no-cost, if you purchase a ticket to the Summit I will receive a commission. This entry was posted in Blog, Events on July 13, 2011 by Become a Coach Team. On a recent teleclass Andrea Lee shared three strategies that the late Thomas Leonard used to attract a worldwide following while building Coachville. One of the strategies she shared is applicable to all coaches, entrepreneurs, managers, employees etc. It was about finding the extreme. In other words, how can you be the ‘ST’ at something? When it comes to your personal or business vision and mission, a project, your job or career etc., which ‘ST’ could you be? Will you be the boldest, fastest, most popular, completest (and yes, that is actually a word)…. You get the point. In order to differentiate yourself from other businesses or employees, you have to offer more than the status quo. If you apply the above strategy, you can elevate yourself above the noise of the crowd. If you missed the call or are curious about the other two strategies, you can listen to it here ==> Best of Thomas Call. This entry was posted in Events and tagged Andrea Lee, Thomas Leonard on March 23, 2009 by Become a Coach Team. On a free teleseminar on Thursday, March 12th (4 pm Pacific) Andrea Lee is going to reveal three techniques the late Thomas Leonard used to add attract a worldwide following. For those of you who don’t know, Thomas was the founder of the International Coaches Federation (ICF), CoachU, CoachVille and the IAC (International Association of Certified Coaches). Some even feel he was the founder of modern coaching. He had this incredible capacity to create. His passing in 2003 left a void in the coaching industry. Andrea Lee was the general manager of Coachville and worked closely with Thomas. She’ll be releasing some of his intellectual property (which is vast) as products in the near future. To register for this fre.e call visit: Best of Thomas Call. This entry was posted in Events and tagged Thomas Leonard on March 11, 2009 by Become a Coach Team. The CoachVille Tour has been shortened from 70 cities to 24 cities. It starts in San Diego on April 14th, 2008 and ends in Charlotte, NC on June 18, 2008.
power of personal coaching – remains the same. If you live near a city on the tour and you’re thinking about becoming a coach or you already are one, it’s worth checking out. Even if you just learn one new tidbit that you can apply to make your life or business better, it’s a win. This entry was posted in Events and tagged CoachVille Tour on February 28, 2008 by Become a Coach Team.